We often have kids round to visit who are fascinated by the 3D printer. It's nice to be able to print them a small object to take home. Over time we've built up a list of small fun things that we can print for children while they are visiting. 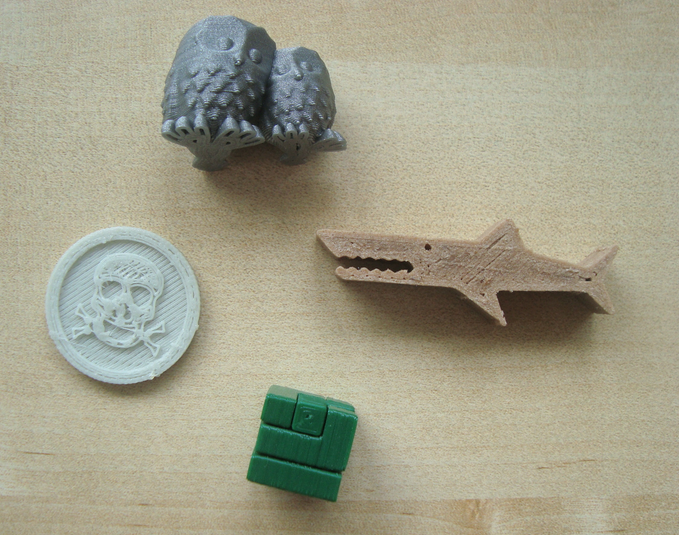 For this purpose the objects must be small enough to print in under an hour, 30 minutes is better. And they also need to be interesting enough that kids think they've got a cool object to take home. Some kids like to watch the whole thing being printed. We've had kids as young as 4 sit for 30 minutes and watch an object being printed. We've had a 6 year old who rushed out ever five minutes to see how much further his shark had progressed. And we've had 9 and 10 year olds who want to really understand how the 3D printer works and how the models are designed. If kids are going to be watching the print make sure you give them a safety talk first. It's an absolute pleasure to share 3D printing with enthusiastic kids who visit - our own kids now think 3D printing is perfectly normal. They love it, but in a very practical, everyday way. Watching kids see an object 3D printed for the first time is a brilliant experience that we want to repeat as often as possible. These objects would also work well if you are running a club or educational session for kids. Pirate Coin - this is a really quick and simple print, but kids love it. The one in the picture above is printed in glow in the dark filament which adds an extra bit of coolness. These coins print very quickly and you can do several at once, this is what we go with if we have several children visiting as they can each get something small without it taking too long. Cuddling Owls - a cute little pair of owls. A good choice for girls. It can be scaled down to print quickly. The one in the picture above is under an inch tall. Mr Jaws - Mr Jaws is a shark who also performs a useful function - he can clip an opened packet of chips shut. This one has been very popular. We currently need to print another one for a child who has lost theirs and is very sad about it. Mini Puzzle Cube - this is a nice one for older kids, it's tiny, but you can take it apart and solve the puzzle. You probably want to print one of these first without kids watching to make sure your printer is calibrated well enough for it to fit together. Toothpaste Monster - this actually works really well! Kids can pop it on their toothpaste tube to squeeze out the toothpaste. Dragon Bookmark - a Chinese dragon bookmark which can be used with retro-style paper books. Mini Heart Cutter - a little shape cutter that kids can use with play dough or modelling clay. Another option that works really well is the make a keychain or tag using the child's name or initials. You'll need to create a custom model to do this. We'll look at how to do that in a future article. Update: See our kids 3D printed nametag tutorial for Tinkercad.